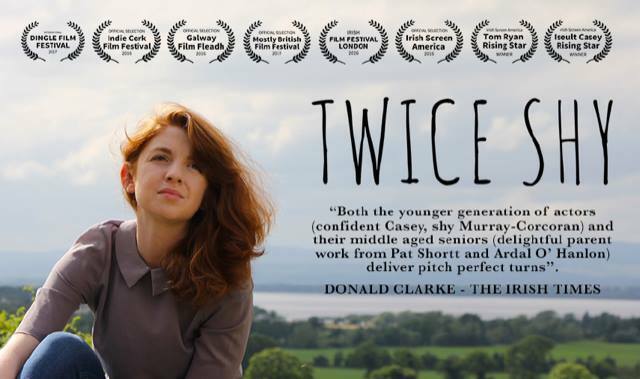 Youghal Cine Club is delighted to screen “Twice Shy” an independent Irish film produced by Fionn Greoger. “Twice Shy” will screen at the Mall Arts Centre on Dec 20th and will be introduced by the film producer, Fionn Groeger, himself. Fionn is well known to many of us here in Youghal, he having spent many of his teenage years as a resident. Twice Shy successfully premiered to a packed audience at the Galway Film Fleadh in July 2016 and was released in cinemas in June this year after a successful screening at Cannes. The film is a modern coming of age drama that revolves around a young, unmarried couple (Shane Murray-Corcoran, Iseult Casey) who set off on a road trip from Ireland to England as the result of an unplanned pregnancy. The film portrays their journey, through the ups and downs of their relationship and features support from a stellar cast including Ardal O’ Hanlon (Fr. Ted), Pat Shortt (The Guard, Calvary), Mary Conroy (Ros na Run) and Paul Ronan (Love / Hate). Director Tom Ryan wrote the story for Twice Shy in the hopes of reflecting a modern Ireland and addressing some topical issues in a relevant non-judgemental manner. It is his second film since his impressive micro budget debut film ‘Trampoline’. He received the ‘Rising Star’ award at the Irish Screen America festival in LA for the film, as did Iseult Casey for her acting (debut performance on film). Tom teamed up with film producer Fionn Groeger who works at Amazon as a producer in London. Fionn who studied at UCC met Tom in London where they worked together some years back. Twice Shy was filmed over the summer of 2015 in Ireland and England. The film features songs from an array of fantastic talent such as Ash, Gavin Jones, Republic of Loose, Molly Sterling, Natasha Slater and The Corrs. The original score for the film was composed and arranged by Patrizio Knight. The film’s audio mix was finished and mastered in London by Adam Smyth in Soho Square Studios. The film’s editor was Matthew Supersad. Tickets may be purchased via EVENTBRITE or at the door on the night.